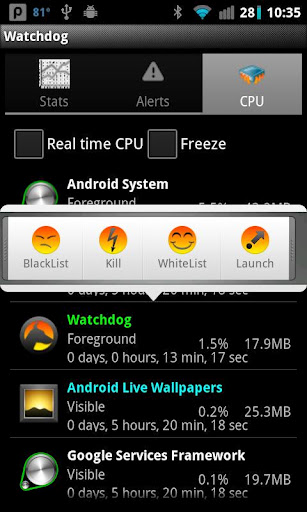 Watchdog Task Manager (Android) - Be notified about misbehaving apps ~ Android Forever! Many knowledgeable people tell us that apps that kill every other running app are not needed on Android devices. This may well be so (it's still fun to do though, makes us feel powerful), and if it is true we really don't need app killers. Unless a single app just freaking loses it and goes on a rampage! In that case, what you need is an app that will spot the misbehaving, riotous app and allow you to kill that single app. Developer Quote: "You don't need a task killer. But you do need a way to make sure a background app doesn't lose control and eat up all your CPU. Watchdog monitors your apps and alerts when one loses control, allowing you to kill just that single app." Watchdog Task Manager is available as a FREE or a paid app on Google play!